Sony had a rough year in 2012 as they couldn’t compete with smartphones and tablets from Samsung and Apple. The Japanese-based corporation absolutely doesn’t want to be forgotten in the gadget history and now they are coming back stronger. After the announcement of Xperia Z smartphone, Sony is silently announcing the Xperia Tablet Z. This is quite a big surprise because there was not any revelation at CES 2013 a few weeks ago. Today Sony simply announces the new tablet in a press release on the Japanese Sony Mobile website. They just showed some photos and specifications of Xperia Tablet Z, there hasn’t been any details on pricing and exact release date of the tablet. We just know that the Tablet Z will be available on Japanese market in Spring 2013. The 10.1-inch tablet will be available in 2 colors, black and white. Regarding to the specs, it packs a full-HD (1920 x 1200) display (the Reality Display showing better HD images), a Qualcomm 1.5GHz quad-core APQ8064 processor, 2GB of RAM, 32GB of internal storage expandable with microSD card, 8.1 MP rear camera, 1MP front camera, S-Force Front Surround 3D, NFC and LTE support. It will run Android 4.1 Jelly Bean and powered by a 6,000 mAh battery. The battery is much lower than the 9,000 mAh battery of Google Nexus 10, so we expect Sony has a better power management so that the tablet could last longer than 9 hours. However, it is not the impressive tech specs making Xperia Tablet Z stand out. What is awesome in this device lies in its design. Sony Xperia Tablet Z could be considered the tablet version of Xperia Z Smartphone as it shares the high-end premium finish and the tablet is also waterproof and dustproof. Besides, it is just 6.9 mm thick and weighs 495 grams. Let’s take a comparison to Google Nexus 10 and iPad to see how amazing it is. Tablet Z is thinner than all Apple tablets out there (even the iPad Mini), the latest iPad 4 is 9.4 mm and weighs 652 grams. The Google Nexus 10 also can’t compete with the Sony’s tablet as Nexus 10 is 8.9 mm thick and weighs 603 grams. 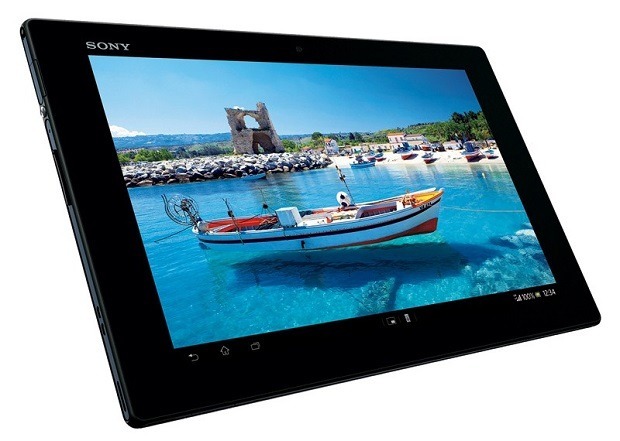 Sony expects that the flagship tablet will ship total 240 million units worldwide in 2013. However, to achieve that goal, they should make the Tablet Z available on important markets like Europe and the U.S. as soon as possible. Samsung and Apple are ready to launch their new tablets for 2013 as well and timing are so important for the success of Tablet Z. What are your opinions about the new Sony’s tablet? Is it attractive enough to cost you some money?